150 women converged on women's section of the Western Wall and read the Megillah without any police interference. 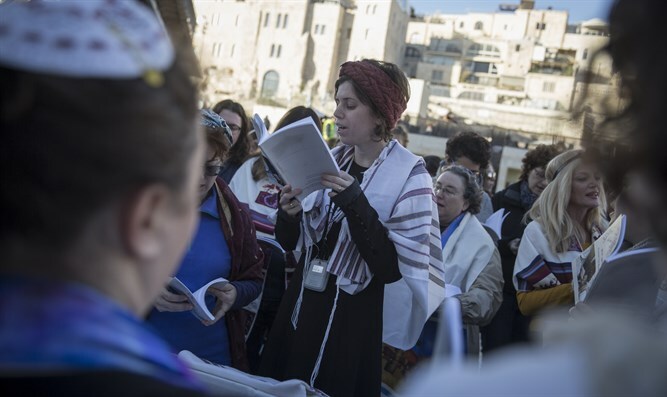 150 Women of the Wall gathered Monday in the women's section of the Western Wall to read the Megillah. As opposed to previous years, the Western Wall authorities did not interfere with them. The women described the successful reading on their Facebook site. "This time, as opposed to previous years, we were allowed to bring graggers (noisemakers whirled when the name of Haman is read) into the Western Wall site." Two weeks ago, thousands of yeshiva students and ulpana high school girls from National Religious schools came to the Western Wall to protest the continued desecration of the holy site by the Women of the Wall organization. The women had come as they do every Rosh Hodesh (first day of the Jewish month) to arouse provocations and to read from a Torah scroll in violation of normative tradition at the Western Wall amd as mandated by the rabbi in charge of the site. The organizers of the protest called on Shas leader Aryeh Deri and the other religious parties to pass the "new Western Wall law" which will restore halakhic authority over the Wall to the Chief Rabbinate and prevent further provocations by the Women of the Wall.